The Cold War was a distinct and crucial period in Hong Kong's evolution and in its relations with China and the rest of the world. Hong Kong was a window through which the West could monitor what was happening in China and an outlet that China could use to keep in touch with the outside world. Exploring the many complexities of Cold War politics from a global and interdisciplinary perspective, Hong Kong in the Cold War shows how Hong Kong attained and honed a pragmatic tradition that bridged the abyss between such opposite ideas as capitalism and communism, thus maintaining a compromise between China and the rest of the world. 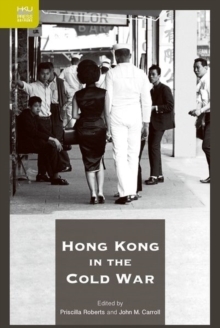 The chapters are written by nine leading international scholars and address issues of diplomacy and politics, finance and economics, intelligence and propaganda, refugees and humanitarianism, tourism and popular culture, and their lasting impact on Hong Kong. Far from simply describing a historical period, these essays show that Hong Kong's unique Cold War experience may provide a viable blueprint for modern-day China to develop a similar model of good governance and may in fact hold the key to the successful implementation of the One Country Two Systems idea.